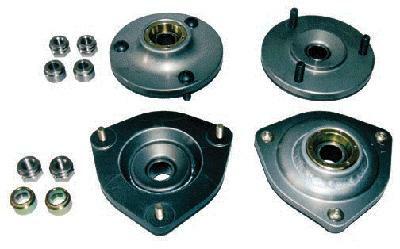 Evolution Motorsports Camber Plates/Strut Mounts are a direct replacement for the original rubber mounted units. The OEM units flex and move during cornering which causes spongy handling characteristics. These precession engineered mounts will add more precise handling while allowing 10mm more negative camber adjustment. Will work as OEM replacements or combined with GT3 or other suspension systems. Each component is CNC machined from 6061-T6 aluminum, assembled with stainless steel spherical bearings and hard anodized.